Have a question about our cables inventory? Looking for a specific product? Fill out the contact form below and a representative will contact you shortly. For an even faster response time, call us at 800-927-8549.. The two types of stainless steel aircraft cable available at Armstrong / Alar Chain Corporation include 316 stainless steel aircraft cable and 302/304 stainless steel aircraft cable. If for any reason you have any questions or comments about stainless steel aircraft cable, feel free to give us a call at 847-808-8885 or fill out the form to the right and a representative will respond shortly. The talented and dedicated team at Armstrong / Alar work hard every day to accommodate nearly any size order and get it delivered to you anywhere in the United States. 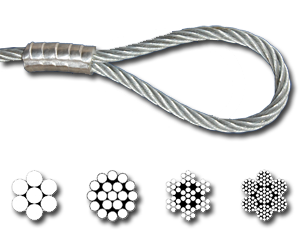 There are different types of stainless steel aircraft cable you can buy with higher rated corrosion resistance and tensile strength. Stainless steel aircraft cable is well known for being the strongest and the most reliable aircraft cable available. Galvanized aircraft cable is a low cost alternative to stainless steel aircraft cable because it is not resistant to as much weather and temperature conditions as stainless steel. The stainless steel aircraft cable available from Armstrong/Alar is very reasonably priced compared to our competitors and can be bought in bulk or in custom lengths. We also can typically ship items in stock in just one working day. Trust Armstrong/Alar for all you chain, cable, rope and accessories needs. If for any reason you have any questions or comments about stainless steel aircraft cable, feel free to fill out the form to the right and an associate will respond shortly or give us a call at 847-808-8885.